This is the only other picture of my reptilian warrior race, the Ka'hael, that I could find. Like the other one (Ka'hael Warrior) this picture is pretty old, I think from late 2006 when I had just started high school. 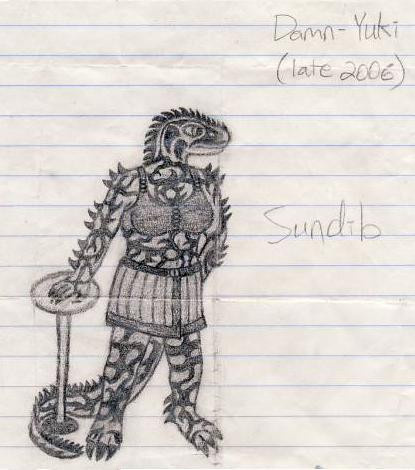 This particular female, who's named Sundib, was going to be a character in my long-dead fantasy story "Fire of the Twins". I pictured her as a minor priestess/medicine woman, which is why she has tattoos all over her. (I didn't mean to put that many on her originally, it just kind of got out of control. ;_; ) However, since the story got the axe, she's been in limbo for almost four years. I've been thinking that I might resurrect her, along with the rest of the Ka'hael, at some point in the future though.